Police have recovered Laura Lee Cranes body and two suspects have now been charged with capital murder. FORT WORTH  A body discovered Tuesday in southern Oklahoma was identified as that of missing retired professor Laura Lee Crane, police said Wednesday afternoon. Two Fort Worth residents linked to her disappearance have been charged with capital murder, police said. Teachers and friends mourn the death of the retired professor. Former professor and Starpoint School director Laura Lee Crane was remembered Wednesday as a gracious woman and an inspirational teacher who made children a top priority. 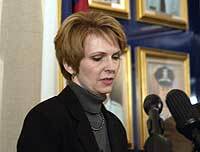 Allen Walker, daughter of retired professor Laura Lee Crane, thanked the community and law enforcement officials for their support in the search for her mother at a press conference held Wednesday afternoon at the Fort Worth police station downtown. A body found near Davis, Okla., was identified as that of the former Starpoint School director. In affidavits filed in the 48th Judicial District Court, Christian Church officials accused Stephen Sprinkle of trying to impede an investigation into sexual misconduct claims made against him. A Brite administrator who says he was barred by Disciples of Christ officials from interviewing prospective ministers because of his homosexuality has also been the subject of a church investigation of alleged sexual misconduct, according to court records obtained by the TCU Daily Skiff. Faculty members take a look at provost candidate Nowell Donovans plans for the university. Provost candidate Nowell Donovan stressed the significance of the liberal arts and sciences in shaping and improving the leaders of tomorrow in a forum for faculty and staff Wednesday. The increase is producing a varied set of opinions among students and faculty on campus. Tuition is going up yet again, and students are talking about the 11.9 percent increase.